New Delhi: The National Human Rights Commission (NHRC) issued notice to the West Bengal government over alleged poor maintenance of a mental hospital in the state. The commission sought a detailed report from the West Bengal government on the Berhampore Mental Hospital, along with the status report on its other similar hospitals in the state. The commission observed that on Independence Day, a team of NGO Anjali visited the government-run mental hospital and found naked men and women patients lying on dirty floors. “They had not bathed or shaved for months, with visible signs of various diseases. The toilets were so filthy that nobody could use them. The bed sheets were full of bugs. Reportedly, the Hospital Superintendent refused to make any comments when approached by the team. The Chief Medical Officer also denied the calls made by the NGO,” said a commission statement. 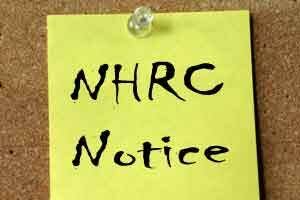 The NHRC said the state-run hospital is bound to take care of its patients. The commission said mentally ill persons are also entitled to the inalienable rights available to other human beings. They are entitled to be treated with dignity, decency and equality and cannot be discriminated against. “There is an ardent need to educate and change the attitude of the public authorities towards the persons suffering from mental illnesses,” the NHRC said.